The last two chapters of Volume II find Mr. and Mrs. Strange finally getting a chance to settle back into life at their home in Shropshire. Then something goes terribly wrong. Jonathan Strange is interrupted from his work one day when his neighbor, Mr. Hyde, stops by to tell him that he saw Mrs. Strange wandering around outside in a black dress. It’s the dead of winter, though, and snowing, and Mrs. Strange has been safely inside the house all this time. This is somewhat quickly forgotten when Arabella’s brother, Henry Woodhope, comes to visit. After several years in London, Arabella is saddened to learn that she no longer has much in common with Henry, who is a country clergyman. For his part, Henry finds much to criticize in the Stranges, who are not at all what he thinks a good country family should be like. Even the house is viewed by Henry with a critical eye. The descriptions of Jonathan Strange’s house, Ashfair, are wonderful. While they are somewhat reminiscent of the descriptions of Norrell’s Hurtfew Abbey, this is only because the two places are similarly weird. However, they are also as different as their owners. By far my favorite line about the house, though, is that it’s “an old-fashioned house–the sort of house in fact, as Strange expressed it, which a lady in a novel might like to be persecuted in.” It’s a really lovely idea that works as a bit of characterization for Strange–so wry, so witty–and as a piece of rather funny meta-commentary in a book that is so clearly a pastiche of several genres of literature, including the Gothic novels that were so popular in the early 19th century. One thing I will say about rereading this book in my thirties is that I appreciate this sort of thing much more now than I did in my early twenties. It’s definitely a style of book that is much better enjoyed the more one has read of other English literature. This is definitely a book that benefits from rereading, and I’m now very much looking forward to reading it again ten years from now. Volume II ends with a heartbreak and a mystery that will define the last third of the novel. One night, Jonathan Strange is awoken and sees Arabella, dressed, at the foot of the bed. Thinking that he’s only dreaming, he goes back to sleep and no one notices anything amiss until after breakfast, when Mr. Hyde arrives again to say that he saw Mrs. Strange only an hour before, wandering in the nearby hills. Jonathan Strange at first dismisses this again, but becomes alarmed when one of the household servants informs him that Arabella actually is not in the house, has actually been gone all morning. Jonathan Strange immediately begins using magic to search for her, although Henry Woodhope doesn’t understand the purpose of this, thinking they should just go out and look themselves. This, in the end, is what they end up doing, as Jonathan Strange’s scrying is ineffectual–Arabella isn’t in England, Scotland, Wales, or France, which is confusing to Jonathan but not to the reader. When Arabella is finally found, she’s wearing a black dress, covered in black mossy water, and saying weird stuff that sounds much more like the ramblings of a traumatized piece of wood than anything a real woman would say. Probably because this is not actually Arabella, but the piece of wood that Stephen Black and the fairy gentleman dug up several chapters ago. On the third day after her “return” Arabella dies, and this is one part of the book that I wish I could read for the first time again. I know that a careful reader should know exactly what is going on here, as everything has been explained to the reader pretty thoroughly through our views of other characters. However, just the line, “On the third day she died,” is marvelous. It’s a shocking end of a chapter, and it’s a shocking end to the second volume of the book. It’s an amazing cliffhanger, and a perfect use of it. Even though the reader should have a pretty good idea of what’s going on here, this ending still manages to shock, and I think it is very difficult to not keep reading after this just to see how the characters react. Possibly the best thing Susanna Clarke could have followed this cliffhanger with is the thing she actually follows the cliffhanger with. It’s not, however, the reactions of Jonathan Strange or Henry Woodhope to Arabella’s death. It’s not a scene confirming that Arabella is in fairy land. Nope. It’s the prologue to Jonathan Strange’s book. In this prologue, we learn more of the history of the Raven King, John Uskglass, and how he came to England in the first place. We also learn a little more of fairies. Mostly, though, we learn about Jonathan Strange’s opinions on John Uskglass and fairies. When we return to the actual story in Chapter 46, it’s still not to see how Jonathan Strange is getting along. Instead, this chapter is centered around Childermass’s point of view. 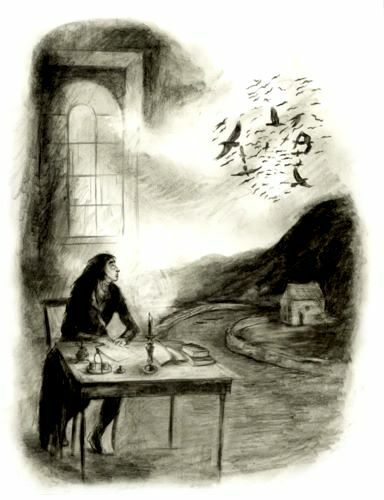 In Mr. Norrell’s library, Childermass is writing letters of business when he starts feeling very weird and slipping into a sort of dreamy trance where he sees strange and disturbing visions that the reader may recognize as connected to the book’s larger themes of the Raven King and fairies and the magic of England–and especially reminiscent of Vinculus’s prophecies. Childermass quickly recognizes these visions as magical, and he tries to figure out whose magic it is. 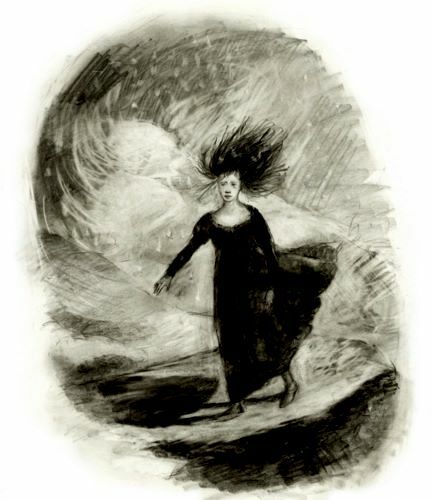 When he finds out that Norrell is not at home, Childermass becomes consumed with tracking down his master, and he reaches Norrell just in time to save him from being shot by Lady Pole, who is distraught over Mrs. 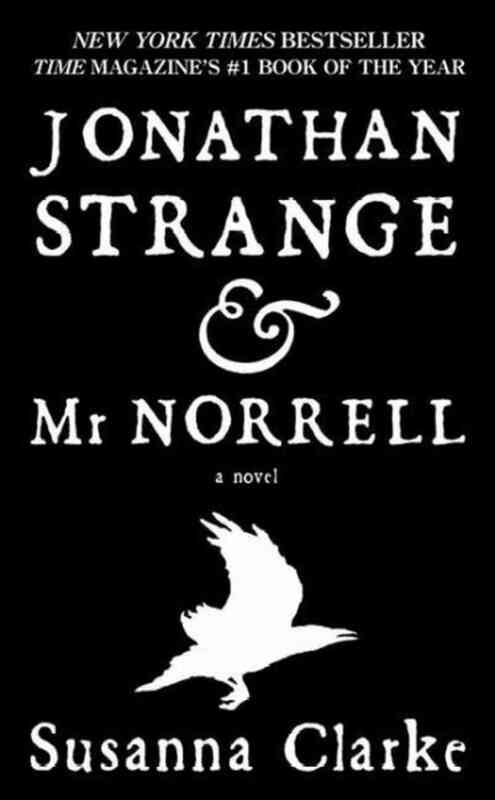 Strange and holds Norrell responsible. All magicians lie and this one more than most.